Last weekend Melanie and I traveled to Winston Salem for nephew's high school graduation. The ceremony was nice although I don't know how the choir rated singing two songs. What made them so special? What I don't understand is why schools even bother asking those in attendance to hold their applause to the end because people cheer for almost every kid that walks across the stage. If they're serious about it they should start tazing and removing from the event those that do cheer before the end. Back at the Clark's house they had a cookout and I love how they did it. Instead of grilling a piece of meat to each guest's specifications they set out some halibut and fixings and allowed you to dress your fish however you wanted. 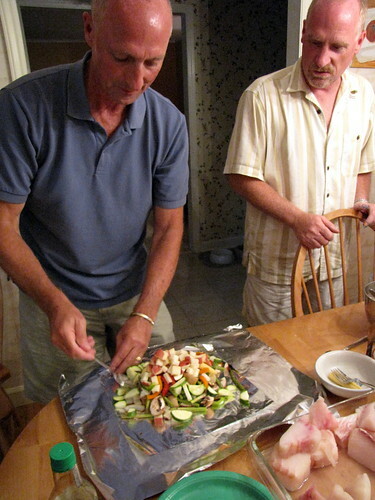 John, father of the graduate, then tossed the 12 tin foil wrapped entrees on the grill for twenty minutes and then we sat down to eat. Every person's dinner was unique and they were all tasty. Mine featured water chestnuts and green pepper. The graduate's uncle, seen below, decided to create his own version of the Food Network show Man vs. Food. He won.